5/16'' removal socket for Hi-Lok®, Hi-Lite®, Eddie-Bolt® Fastener Collars. Patented 1/4'' Female Square Drive Socket with left-hand tapered internal threads, for removing collars from 5/16'' diameter threaded pins. These patented collar removal sockets feature set screws for square drive retention and are made of tough 17-4 tool steel, which has been heat-treated for maximum wear resistance. OMSK3581 series sockets incorporate a tapered bore with innovative ''dual lead'' left-hand threads that grip for quick removal by simply screwing themselves counter-clockwise onto a collar. Collars are then easily removed from the sockets by rotating clockwise with pliers or other tools. This collar removal tool is for use with aluminum, steel and titanium collars. Expect longer life if used with aluminum collars. Removal sockets for Hi-Lok®, Hi-Lite®, Eddie-Bolt® Fasteners. For 5/32'', 3/16'', 1/4'', and 5/16'' Collars. Replaces ATSK3581-4PC. Set consists of: OMSK3581-5/32'', OMSK3581-3/16'', OMSK3581- 1/4'', and OMSK3581-5/16. 5/32'' removal socket for Hi-Lok®, Hi-Lite®, Eddie-Bolt® Fastener Collars. Replaces ATSK3581-5/32 and 3581-5. -5, 1/4'' Female Sq. Dr. Socket with left-hand tapered internal threads, for removing collars from 5/32'' diameter threaded pins. 5/32'' removal socket for Hi-Lok®, Hi-Lite®, Eddie-Bolt® Fastener Collars. Replaces ATSK3581-5 and 3581-5. 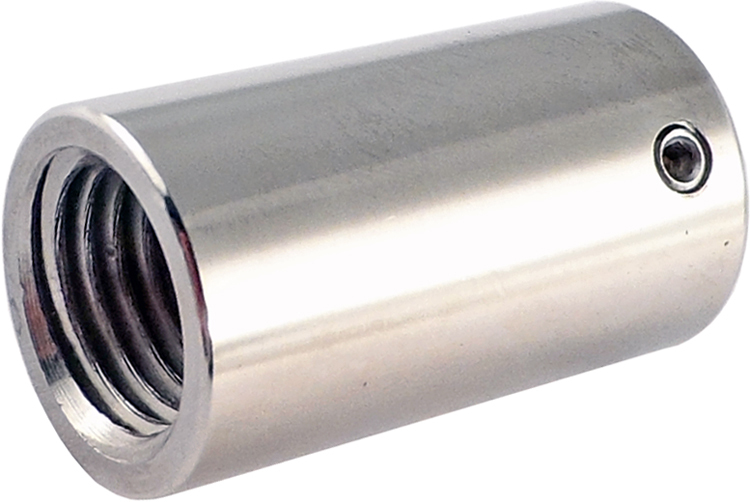 3/8'' External Hex Drive Socket with left-hand tapered internal threads, for removing collars from 5/32'' diameter threaded pins. 3/16'' removal socket for Hi-Lok®, Hi-Lite®, Eddie-Bolt® Fastener Collars. Replaces ATSK3581-3/16 and 3581-6. 1/4'' Female Sq. Dr. Socket with left-hand tapered internal threads, for removing collars from 3/16'' diameter threaded pins. 3/16'' removal socket for Hi-Lok®, Hi-Lite®, Eddie-Bolt® Fastener Collars. Replaces ATSK3581-6 and 3581-6. 3/8'' External Hex Drive Socket with left-hand tapered internal threads, for removing collars from 3/16'' diameter threaded pins. 1/4'' removal socket for Hi-Lok®, Hi-Lite®, Eddie-Bolt® Fastener Collars. Replaces ATSK3581-1/4 and 3581-8. 1/4'' Female Sq. Dr. Socket with left-hand tapered internal threads, for removing collars from 1/4'' diameter threaded pins. 1/4'' removal socket for Hi-Lok®, Hi-Lite®, Eddie-Bolt® Fastener Collars. Replaces ATSK3581-8 and 3581-8. 7/16'' External Hex Drive Socket with left-hand tapered internal threads, for removing collars from 1/4'' diameter threaded pins. 5/16'' removal socket for Hi-Lok®, Hi-Lite®, Eddie-Bolt® Fastener Collars. Replaces ATSK3581-5/16. 3/8'' Female Sq. Dr. Socket with left-hand tapered internal threads, for removing collars from 3/16'' diameter threaded pins. 5/16'' removal socket for Hi-Lok®, Hi-Lite®, Eddie-Bolt® Fastener Collars. Replaces ATSK3581-10 and 3581-10. 7/16'' External Hex Drive Socket with left-hand tapered internal threads, for removing collars from 5/16'' diameter threaded pins. 3/8'' removal socket for Hi-Lok®, Hi-Lite®, Eddie-Bolt® Fastener Collars. Replaces ATSK3581-3/8. 3/8'' Female Sq. Dr. Socket with left-hand tapered internal threads, for removing collars from 3/16'' diameter threaded pins. 7/16'' removal socket for Hi-Lok®, Hi-Lite®, Eddie-Bolt® Fastener Collars. Replaces ATSK3581-7/16 and 3581-14. 3/8'' Female Sq. Dr. Socket with left-hand tapered internal threads, for removing collars from 7/16'' diameter threaded pins.